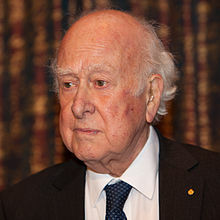 Peter Ware Higgs CH FRS FRSE (born 29 Mey 1929) is a Breetish theoretical pheesicist, Nobel Prize laureate an emeritus professor at the Varsity o Edinburgh. ↑ Overbye, Dennis (15 September 2014). "A Discoverer as Elusive as His Particle". New York Times. Retrieved 15 September 2014. This page wis last eeditit on 30 Mairch 2017, at 19:32.